And so it starts, my headlong dive into a trio of gen-stein-franken-Tudors. It started with a 17j Tudor ETA 2784. Picked it up off VRF for a reasonable price. Or so I thought until I discovered not only did it need a full service cleaning but replacement automatic works Bridge, keywords needed to be rebuilt, and a new balance required (still waiting on the balance). Regardless this inspired the first project, a blue 9411/0. - MQ Case w/ lugs reshaped, CG’s reshaped, tube retapped, chamfers recut, and repolished. The pleasure of working on genuine movements and gen spec VN cases inspired me to continue the trajectory into these gen-stein-franken-Tudors. I’m partial to them for their cost - Rolex movements are out of control. 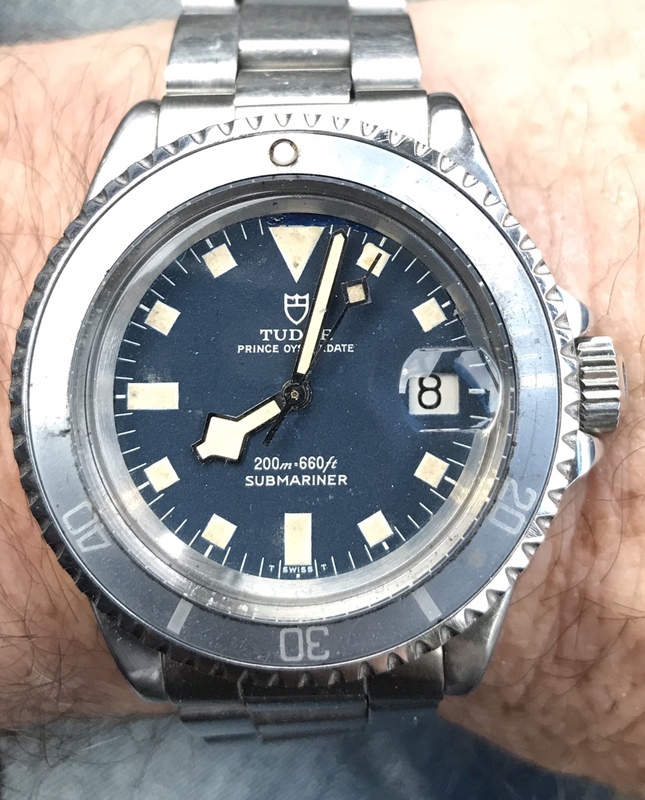 Tudor movements are still reasonable, parts are readily available, and easy to work on. The 2462 was missing a barrel bridge screw and someone installed the wrong screw in the minute c o ck. I was able to harverst those from the 2461 and it was off and running nicely. It even came with an interesting Tudor crown. The 2461 is now missing the two above mentioned screws plus the winding pinion, and stem. Hopefully a few parts and it’ll be up and running. And now begins the hunt for 7021 and 7016 case/dial/etc. I think I’m going to go for a 7928 dial on the 7016 and a black snowflake on the 7021. Guess what this is all leading me towards? Hunting for a Tudor 390 movement to eventually build a 7922 big crown. Whoa, this is going to be epic, looks like you're already well on your way to a sweet blue snowflake build. Going to do any USN or MN engravings? How do you plan on getting a rose dial for the 7016? I have this guy sitting around but unfortunately it's the 395 with date so I'm not sure if it's worth using. Last edited by jimcon11; 20-01-19, 00:47. Well, first step has been preparing the case to better accept a gen 7030 Tube and 704 Crown. As the case come from MQ, it has an afterthought of a countersink for the tube. This causes any gen spec tube to sit proud of the case - which also causes the crown to float away from the case. I measured the two steps in the tube, 3.9mm and 4.9mm. Unfortunately I could not find those exact end mill, 4-blade, flat, carbide cutting bits so I ended up with a 4mm and 5mm. Thankfully it was close enough and the tube fit snugly into the end countersink. As you can see, I continued to bore in with the 4mm and stepped up to 5mm for the upper portion. It was a process of cut, measure, cut, measure, test the tube, repeat. I was using a precision milking machine but I think a drill press would work fine as well. Crown sit tight and flush. Next endeavor will be the lugs - reshaping a bit. Right now I'm not planning on the USN or MN engravings. Given the two snowflakes have the date, it doesn't seem appropriate. As to the 7016 - that's the last on my list as I need to repair the movement. So far it seems the VN dial suppliers only have white, not gilt. I may try to do my own dial. Finished reshaping the lugs this evening. Cut down the top a bit to make more gradual the slope from the rehaute down to the tip, then recut the chamfer, and repolished everything. I did intentionally ease the edges of the chamfer, I don’t want sharp, new cuts. So, I take back anything bad I have ever said about a lume application to a Tudor Dial - what a pain in the...every plot has four corners. But it’s done and I like it. Oh, and yeah, it’s a matte black dial now. Turned out Phong got a bad batch of gloss blue dials for gen movements. The date window misaligned to the date wheel. He promptly sent me a black one with a black insert. When the blue ones come in I’ll pick one up and swap it out. For now my 9411 will be a black dial project it seems. Dial looks really good, did it come textured like that? Yes, dial came as shown with the exception of the lume. My glucydur balance wheel arrived from germany! I decided to pick up a standard nickel balance wheel for now to get my watch going (it was supposed to be my Christmas gift to myself after all). That is installed and things are running smoothly. Since I’m with a matte black dial I need to decide on the insert. Three to choose from: Phong Black, Slay Kissing 40 Black, or Phong Blue. Nothing has been aged yet but when I do it’ll be a light touch. Lets crowd source some thoughts on this, what do you like best? The blue bezel looks great with that lume color. Really nice job. mzinski this is a great set of projects you are undertaking. I also am partial to the faded blue inserts. I have seen this addiction before. I have lived it. I have already built the 7021, 7016 Rose and the 94010 triangle. The Tudor collection goes well beyond that now but those were my core starters. Really looking forward to watching you collection develop. May i ask you where dis you get that insert? Looks good! Funny how we're nearly parallel in our Tudor ambitions. I'd love to see more pictures of your collection and I'm curious what it goes well beyond in to. Do let me know where I can find some pictures. So what are the specs on this 7021? Gen dial...and? The insert looks good - can you elaborate on your aging process (if you aged it)? Gen dial, insert, crown, 93150 bracelet and end links. Phong case with reshaped cg’s. Aged rep hands and pip to be more like the dial. Not for the faint of heart. Expensive build but well worth it! ??????????? ?